Telecom Regulatory Authority of India Mobile Number Portability (TRAI MNP) - change telecom service provider without changing mobile number. Could change mobile service provider after 90 days from the date of activation of mobile connection or from the date of last porting of mobile number. 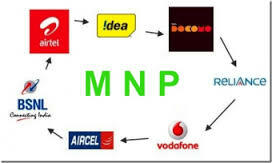 Presently you are allowed to change mobile service provider within same service area. If postpaid subscriber ensure that all dues have been paid. Porting mobile number charges applicable. May seek simultaneous porting up to fifty mobile numbers belong to existing service provider.